The car scrunched down the gravel track, bumping from rut to rut before lurching to a halt in front of a battered old gate. Children turned to look as we got out of the old Toyota. Elderly men squatting by the side of the road stroked their beards pensively as they observed us. As we pushed open the gate and entered the graveyard it felt as though several hundred pairs of eyes were fixed on us. They weren’t hostile, merely curious, as the locals tend to be when a tall Englishman and his Pakistani friend turn up in a bazaar in northern Pakistan. I had come to visit Murree’s Old Cemetery. Murree, a town some forty miles from Islamabad, flourished when the soldiers and administrators of the British Raj realised that spending the summer months in the verdant foothills of the Himalayas was preferable to sweating it out on the plains of the Punjab. Every summer, as the sun soared in the Indian sky and the mercury rose ominously, the British would flee, trailing up into the hills like animals fleeing from a brushfire. Here they would remain for the worst of the summer heat. Here they built hotels and cottages, here they danced, here they came to recuperate from injuries sustained on the battlefields of the empire. And here they died. The cemetery tells their tales well enough. Rows of graves, some plain, others ornate, some crowned with crosses which seem incongruous in what has now become the Islamic Republic of Pakistan, tell of the generations of British imperialists who died here, so far from home. Some graves are those of soldiers – “In Memory of Lt. David Albert Beere”, “Pte. R. F Theobald” – others of administrators – “Charles Arthur Sharpe, scholar of King’s College Cambridge and Engineer in the Public Works Department of India” – while others are painfully personal, such as the grave of one Violet Rose Ward who died aged 30 leaving a husband and both her parents, or that of young Heather June Finnegan who died in 1945, aged 7. 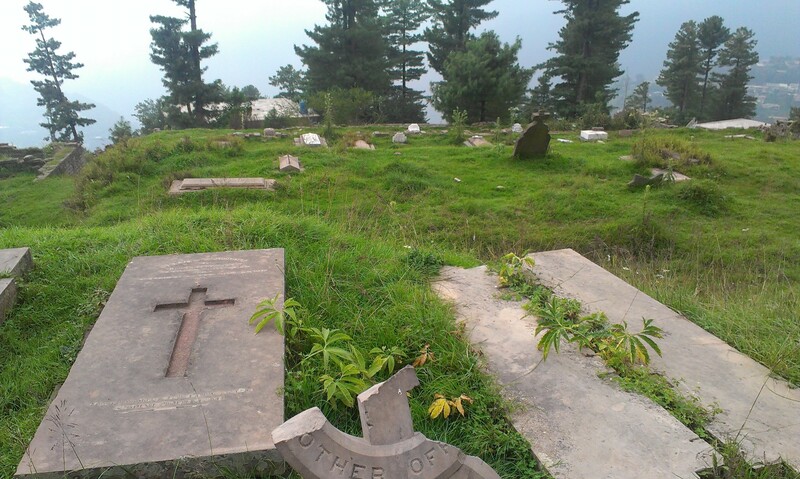 The cemeteries of Murree – there are several – testify to the diversity of the British Raj. All of society was here, from babies to grandparents, brilliant young scholars to hoary old veterans of the Afghan Wars, and when they died they were buried in traditional Anglican cemeteries, a last taste of home in a distant land. The Old Cemetery is overgrown now. Many of the graves are broken, their headstones toppled by tree roots, while goats crop the grass and leave their droppings on the decaying slabs of marble. It is neglected, ignored by the seething masses that throng the bazaar outside. It is a poignant place, full of memory, a corner of a foreign field that is, somehow, England. We pushed the gate open, let it creak shut behind us, and walked back to our car as a squadron of emerald parakeets careered overhead, the sound of their screeching echoing around the valley.